August 12, 2012 | Posted in Interactive and tagged CIID, Copenhagen. 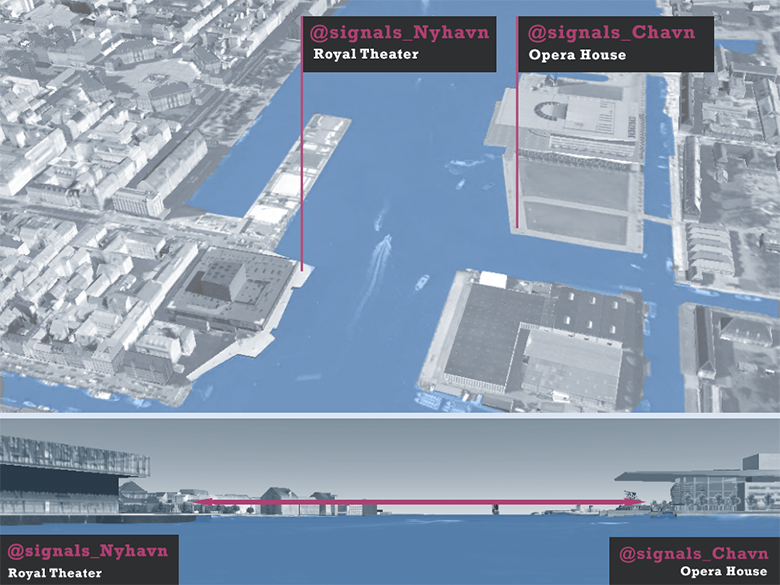 This project is connecting two Copenhagen neighborhoods using the old maritime technology of SignalLamps, combined with the modern network layer of twitter messages. The aim of this urban intervention was to connect the two sides of the harbor, that are geographically close but still feel disconnected. Furthermore, it showcases how communication between remote locations was achieved in the past, in the context of Copenhagen’s maritime culture. The installation has a graphical user interface to allow users to type their message. An Arduino is translating the message into Morse code and transmits the signals using old maritime signal-lamps. The same interface is placed on the receiving side, which serves to decode and display the messages. Each of the two SignalLamp stations has its own twitter account so people can follow the conversations between the two harbor sides online. 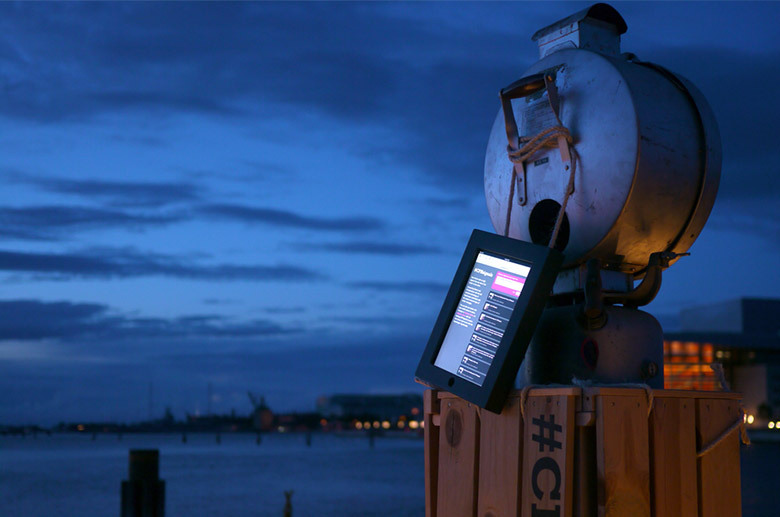 User from around the world can also use twitter to send a new morse-code-message by an @reply to one of the Copenhagen SignalLamps and broadcast their message into the harbor. 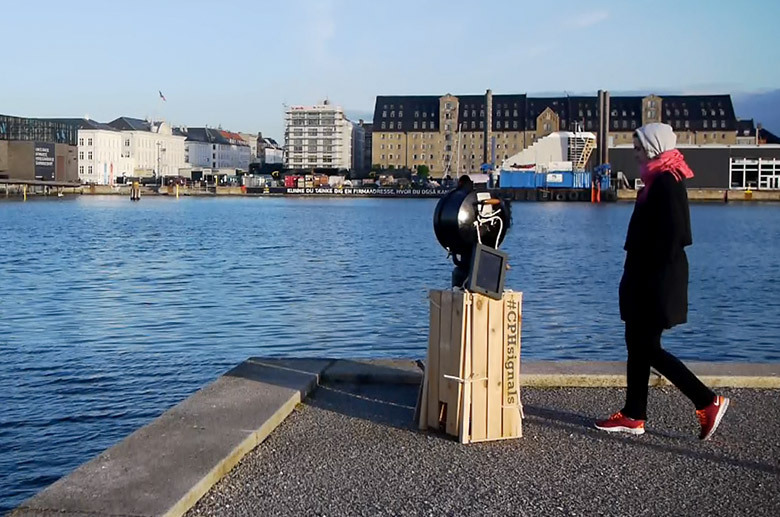 #CPHsignals is a fully functional prototype and was successful in provoking interactions between the two sides while exhibited in the Copenhagen harbor. 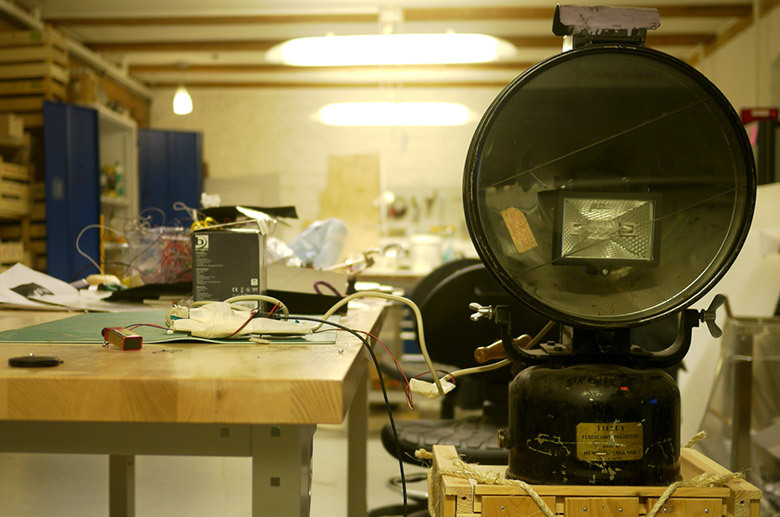 The SignalLamps were kindly sponsored by maritime-antiques.dk and special thx @ Sebastian Schuster for his Dev Support. A project together with Ana Catharina Marques and Kostantinos Frantzis for the Systems & Layers class at CIID. Faculty: Adam Greenfield & Engin Ayaz. Update 2 – We did an Interview for the CreatorsProject Brasil. Here the english transcript. How and why you came up with the idea for CHPsignals? This project was developed during a course called System and Layers at the Copenhagen Institute of Interaction Design. The course was about the different layers that cities have and how the inhabitants are connecting or interacting with these layers. Different kinds of interaction can transform the way a city is perceived. So, we started to analyze which layers the city of Copenhagen has and one of the most visible and strongest layer of Copenhagen is the harbor. The city is rounded by water, this geographic conditional determined the way that the city was developed and the way that the population moves around the city. On the same way, this conditional separate parts of the city that is visually connected but physically inaccessible because the existing bridges are located far apart. The Opera house and the Royal theater are two of the biggest landmarks in Copenhagen and only about 300m away from each other. But it would take 17-18 minutes to reach the other side with a bike for example. Following these research the idea to connect the edges of the harbor with some sort of communication-system appeared. Nowadays, old historic ships still are very present in the harbor of Copenhagen. That was the point were we started to be highly interest to combine the old and the new. 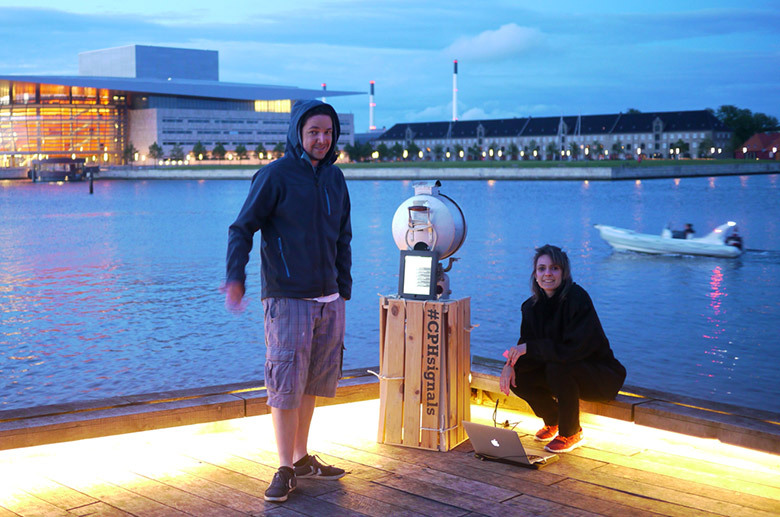 Our project was a way to rescue the old maritime communication way towards a modern digital urban society. How does it connect the iPad with the spotlight and how the text is converted to the morse code shown messages sent using lights? The user types a message on the Ipad interface we made. 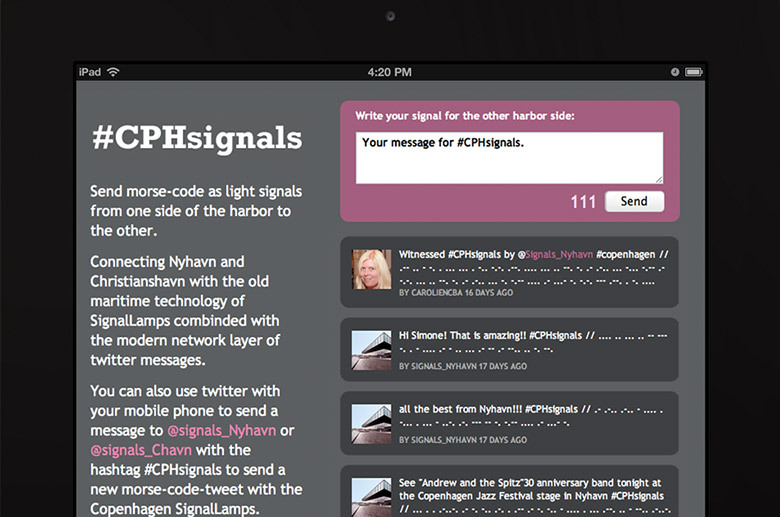 When they send the message, it gets uploaded on twitter on the transmitting sides account (either @chavn or @nyhavn). A small computer, located in the wooden case under the signal lamps, uses the Twitter API to retrieve that message and once it does, it sends it to an arduino board (also located in the wooden case). The arduino is programmed to break the message into a series of letters and spaces. Each letter is then converted to a series of dots or dashes (ie Morse code). Essentially a High-Low (or ON-OFF) voltage waveform is created. This waveform is then sent to a relay (an electrically operated switch) which turns on and off the signal lamps to transmit the morse code signal. Our installation was exhibited only for a short time. During that period people came by and where highly interested in discovering what it was and how it worked. People even used their smartphone to send messages for the Signal lamps after they left the installation. For us, entertainment was just one layer of #CPHsignals. 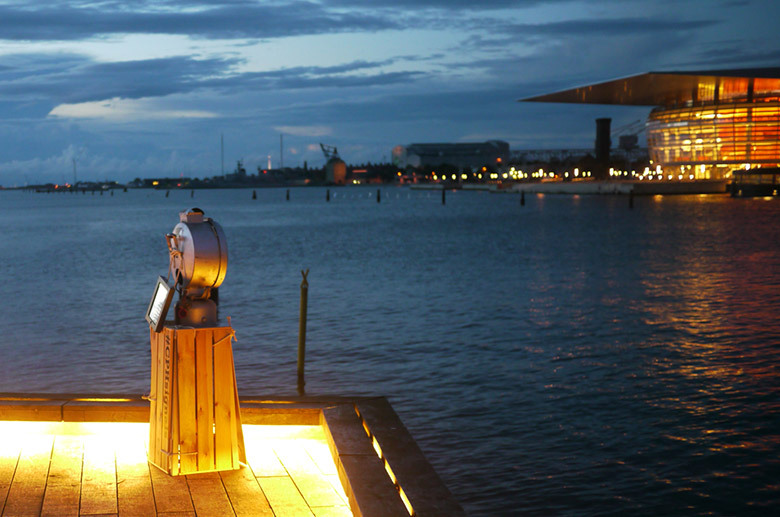 Our primary objective of the installation is to connect Copenhagen with its maritime history and give an insight as to how communication over distant locations was achieved in the past. The twitter layer was added as a comparison for people to see the differences, between old and new, the antique and modern. #CPHsignals can be viewed as a historical or educational tool while combining entertainment and aesthetics into the whole experience. Could CHPsignals be adapted for other cities, like Rio de Janeiro, or São Paulo, for instance? Yes, our project could be adapted in any city connecting places that feel disconnected. For example, in Rio de Janeiro the signal lamps could connect Urca and Pão de Açucar, or be around Lagoa Rodrigo de Freitas. Brasilia can be another example, at Eixo Monumental there is a sequence os importants places for the city, they seem close, but because of the scale of the city they are far distance from each others, the signals lamps could be one one to connect then and transmit information about the places. 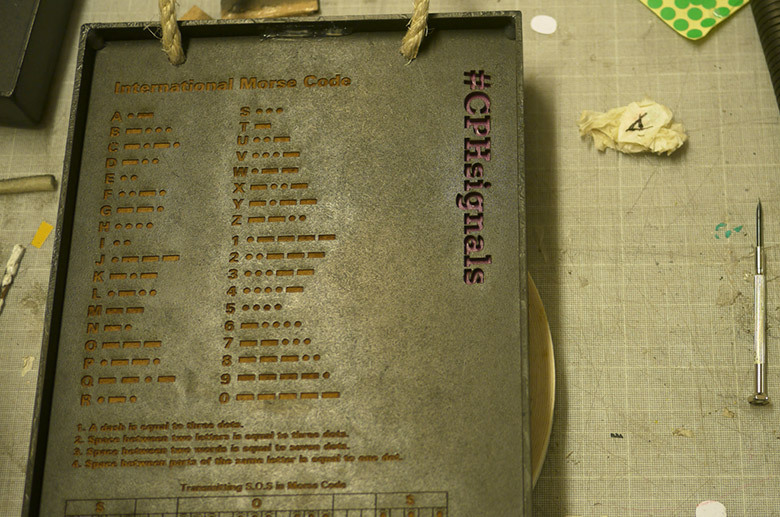 How do you feel about working with this two extremes ways of communication, morse code and twitter? It was a challenging for us to come up with a solution for connecting both technologies. Twitter is in the same way limited as Morse Code was. Both systems were successful in using the cutting edge of technology of their time while having a simplified functionality that made it usable and successful. Both systems are completing each other in our project. One part produces the message in a digital way to be saved and be accessible online, the other part translates and transmits the message in an analog and visible way that interferes with the landscape’s perception.